There is nothing better than a flavoursome rice salad as a main course for your meal on a warm summer day, nothing! The whole Italian peninsula is full of recipes for rice salads, my favourites come from the regions in central Italy where their rich rural culture uses whole grains like spelt and barley which add great texture to the dish. I’ve taken inspiration from this regions for today’s recipe using Riso Gallo’s 3 Grains to create an amazing salad of Italian rice, spelt and barley. 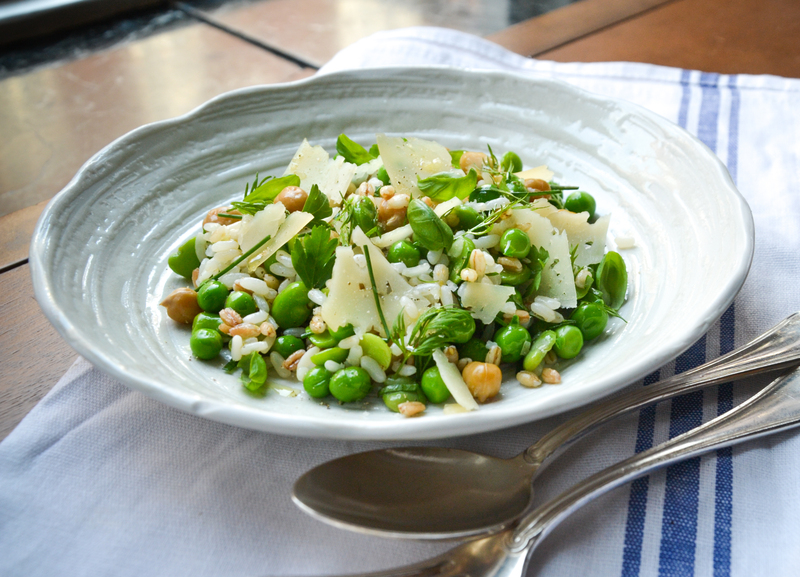 The pairing of the ingredients follow a traditional Roman salad made with fresh broad beans, pecorino cheese, and mint, making it a very seasonal, light and zingy dish. This ‘3 Cereali’ recipe is great as a starter, full of the freshness of the broad beans, peas and fresh herbs, but also very good as a vegetarian main course with good carbs from spelt and barley and protein from the chickpeas. Strive for fresh peas and broad beans but you can save time by getting frozen peas and broad beans ready to boil. If you have time use dry chick peas, soak them overnight and simmer the following day. Alternatively, go for the already cooked option. This recipe is so easy to make, it only takes 30 minutes, and can be prepared hours in advance, stored in the fridge until ready to use, just make sure it is at room temperature when served. Love Rice is a website dedicated to all things rice, containing information on different varieties of rice, the nutritional aspects of rice, as well as tips for cooking rice to ensure perfect results every time. Love Rice also contains a wealth of delicious recipes from traditional curries and risotto to dishes more suited to special occasions such as rice-based desserts and bread. Boil the peas and the broad beans for 1 minute in salted water than cool them down in iced water to retain the beautiful colour. Peel the broad beans from the thick skin by hand. Leave the peas as they are. Meanwhile, cook the Riso Gallo ‘3 cereali’ in salted boiling water for approximately 20 minutes. Even less if you like your rice al dente as I do. Cool under running water. Drain the chickpeas from their cooking water. In a large serving bowl combine the “3 Cereali” with the cooked chickpeas, the peas and the broad beans. Dress with extra virgin olive oil, balsamic vinegar, a pinch of salt and pepper to taste. Shave the Pecorino cheese on top and garnish with the fresh herbs to serve.